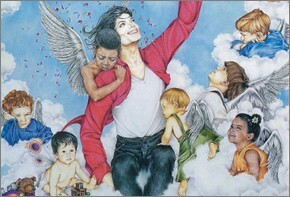 « Passionate about art, he was an insatiable collector as well as a patron for a small group of artists. Among them, the Americans David Nordahl and Nate Giorgio but, more surprising, a little Frenchie : Celine Lavail. The young self-taught artist lived a fairytale with the pop star. At 17, she passed on to her idol a sketch inspired by Walt Disney. Michael loved it. It marked the beginning of their story ». 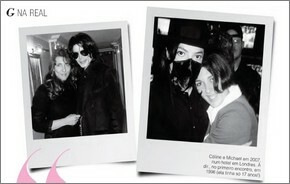 « Thirteen years after she first met the King Of Pop, Celine Lavail still gets emotional when she talks about it. 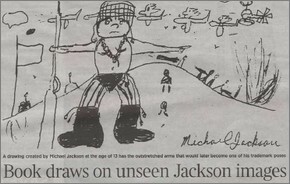 She was a high school student and a Michael Jackson fan and she had an unusual pastime : drawing Michael in fantastic universes. Knowing how interested he was in painting and motivated by her wish to meet him, the teenager took advantage of a concert in Monte-Carlo to bring him her drawings ». « On impulse, by chance, by hazard. It happened in 1996. 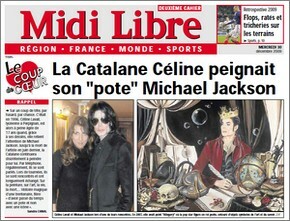 Celine Lavail, a high school student from Perpignan (South of France), was 17 years old when she caught Michael Jackson’s attention. The Catalan discreetly continued to paint for the artist until his death, last June. They regularly chatted on the phone. During tours, they met and talked to each other at length. About paiting, art, life, death ». 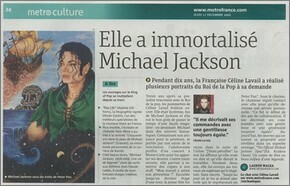 « A note he left to a Parisian artist he had commissioned will be seen by some fans as an eerie portent. Quoting Michelangelo, he wrote : ‘I know the creator will go, but his work survives, that is why, to escape death, I attempt to bind my soul to my work’. He adds : ‘Dedication, Will, Belief creates all things. MJ' ». In February 2015, Glamour Brasil published a two-page article about Celine Lavail’s story.